Cmdr. 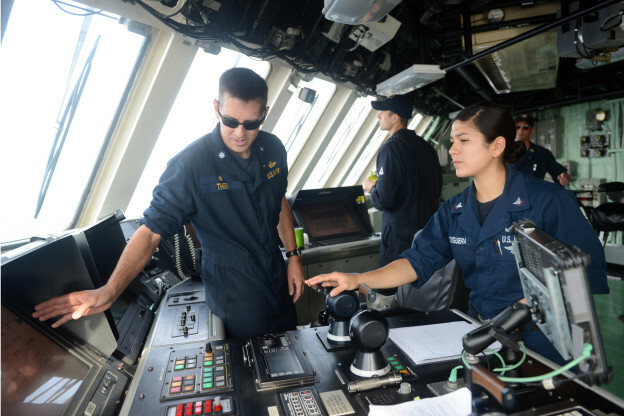 Pat Thien, left, Commanding Officer of the littoral combat ship USS Freedom (LCS-1) on Aug. 13, 2013. The Navy is considering increasing the crew sizes for both variants of the Littoral Combat Ships (LCS) by 2015, according to a July report obtained by USNI News based on the early data from the current deployment of USS Freedom (LCS-1) and tests aboard USS Independence (LCS-2). The report — prepared on the Office of Chief of Operations (OPNAV) surface warfare office — recommends the Navy add accommodations to berth 98 crewmembers ahead of a 2014 study that could increase the crew’s size. The plans for LCS — as of early 2011 — called for a core crew of 40 sailors with 19 attached to one of the ships’ planned mission packages and 23 sailors as part of the aviation detachment for a total of 89 sailors. “Navy planners knew these manning targets were aggressive and might need to be adjusted based on experience with operating the [first] ships,” according to the report first reported Monday by Inside the Navy. The Navy temporarily added an additional 10 sailors to the core crew as part of Freedom’s deployment to test the existing manning requirements and assist with maintenance,. The Navy will evaluate the plus up to 50 in the core crew as well as a separate study using a crew of 15 in the service’s Mine Countermeasures (MCM) package on USS Independence (LCS-2). The service is also experimenting with junior sailors with a program that places three ensigns onboard a LCS. Though the Navy is waiting for a planned 2014 Navy Manpower Analysis Center study some in the service have said the additional sailors will likely become a permanent part of the ship’s company. “I think we’ll find that the core crew will no longer be 40; it will be 50 sailors that will now become a cohesive team. Capt. Kenneth Coleman, who works at U.S. Surface Forces as requirements officer for the LCS program, told USNI News in January. The Navy estimates the cost for adding the berthing will be, “$600,000 for LCS 3 and $700,000 for LCS 4. Projected design and engineering costs for future ships are estimated at $6 million for both LCS variants,” according to the report.